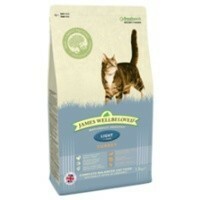 James Wellbeloved Adult Cat Light Turkey & Rice Cat food is a complete diet that is perfect for managing the weight of your adult cat. Excellent for the reduction of ingredient and nutrient intolerances, James Wellbeloved Light has been made from high quality, natural ingredients in a hypo-allergenic formula. My 15 year old cat has been on this for some time now as we were instructed by vet to reduce her weight and so far she has lost half a kilo which we are pleased with. She has very few teeth and the small size of the food is ideal for her and she loves it! She gets one pouch of wet food split into two meals and the dry food split into 4 meals.